The purpose behind Calling Before You Burn is to prevent fire departments from unnecessarily being dispatched because someone who is simply driving by calls 911. By taking two minutes to call first, then 911 dispatchers will already know of the location where a control burn is taking place. Most people are likely unaware of this and it is no one’s fault, thus the reason for us sharing this information with you. Saturday evening Franklin County dispatchers received a 911 call for a structure fire, thus causing New Haven/Berger Fire to be dispatched. The call came in from someone who saw fire and thought a house was on fire when in fact someone was conducting a control burn. No laws were being broken and the burn was being done in a safe manor. 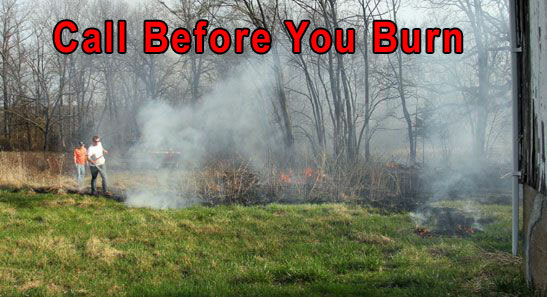 The next time you decide to safely burn off a field or large piles of brush for example, simply call Franklin County Dispatch and let them know. Contact Franklin County at 636-583-2567. DO NOT call 911 to simply inform a control burn is being conducted. **Note: Contact your local municipality and/or Fire Department to ensure you comply to any regulations and/or laws adopted, which may differ from the Missouri Department of Natural Resource’s.